Better known as golden rod. It is a native plant and a favorite of butterflies. Contrary to popular belief: it doesn't cause hay fever! This site provides milkweeds, nectar sources, and shelter needed to sustain monarch butterflies as they migrate through North America. Certified by Monarch Watch as an official Monarch Waystation. Create, conserve, and protect monarch habitats. We need a lot of pictures and a map. 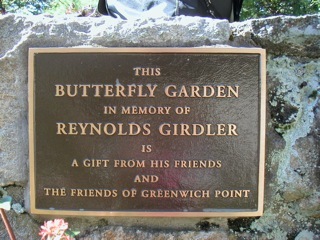 One of the many treasures at Tod's Point is the beautiful Butterfly Garden. You can enjoy the lovely flowers along with the butterflies while appreciating the stunning view. 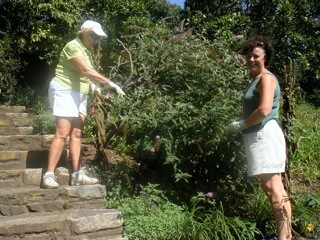 The steps and terraces date back from the original mansion, but the Garden Club of Old Greenwich has been planting and tending this special treat for nature lovers and pollinators.